Suzie Young, President of Rockford Map Publishers, is the third generation to head the company. Founded in 1944, RMP is celebrating its 60th year publishing plat books and landowner information. Located in Rockford, Illinois, Rockford Map Publishers is a family owned mapping company. The principal product produced by RMP is a plat book that is available in both print and digital form. Plat books are compilations of land ownership data by section, township, and county. Each book is issued by county. The county is divided geographically by township and then by section. In theory, each township is 36 square miles and is comprised of 36 sections, each one square mile in area. Because of geography, such as rivers, lakes, and topography, these sizes may vary. Suzie Young heads RMP, as did her mother, Joy Dummer, and grandfather, J.Q. Cummings. Suzie has been involved with all aspects of RMP since high school. A retail window display artist, Cummings founded the company in his home basement in 1944. The first plat book produced by RMP was that of Jefferson County, Wisconsin in early 1945. Since then, nearly 600 plat books, throughout 18 states, have been published. The books cover primarily the Midwest although work is currently being done in Alabama and other markets. Since Cummings founded the company, there have been many changes in how the maps are created. Originally drawn in pen and ink, today the maps are created in a digital format. One thing that hasn’t changed is the way the data are collected. Although some data are available electronically, RMP has found it more advantageous to send staff to research the land records in the specific county. This is particularly important when it comes to verifying questionable pieces of information, Suzie noted. Suzie is proud of these staff for their keen attention to detail, accuracy, and commitment to excellence. This labor-intensive task includes recording land data, such as size, and ownership information. Other than offering plat books, RMP can customize maps to fit a client’s needs. Examples are cow census maps, school district maps, and zoning maps. The data are also used to create four-color laminated county wall maps. Full on-line data delivery will also be available in the near future. The client base is as diverse as the product. Agricultural, real estate, and land development businesses are the primary consumers. Hunters also buy the product to identify land ownership and public hunting grounds. Utility companies, such as telecommunication and pipeline, find the data helpful in planning new routes. The books can be found in many county clerk offices, too. RMP keeps an historical archive of each plat book. A diverse group of clients use the archive – from genealogists to site planners. These books give a record of who lived on the property or how the property was used. For example, a chemical company may have owned a parcel and may have disposed of toxic waste on the site. Heading into its seventh decade, Rockford Map has found that its products are very much in demand by government officials, business owners, and individuals alike. To find out whether RMP publishes a plat book of your area, turn to the Web at www.rockfordmap.com or call 1-800-321-1MAP to place an order. Your local 4-H club, farm bureau, bank, or title company may have one too! Today it is common knowledge that in any industry a company needs to be aggressive and open to seeking new markets or ways to utilize their employee’s skills. Whether it is in the production of nuts and bolts or in the creation of maps this rule holds true. Recently Mapping Specialists was presented with an opportunity that illustrates this point. The Lac du Flambeau Band of Lake Superior Chippewa has a reservation in the Wisconsin Northwoods. The tribe is a client of MSL and has been a partner in developing 3-D Lake Maps® for some lakes on their reservation. Now, there is nothing out of the ordinary so far, but when our contact called and asked if we knew how to set up a kiosk, things changed. The tribe had budgeted for and purchased a hard drive, touch screen monitor, and various pieces of software. The only problem was that no one on the tribal staff had the knowledge to program and develop the site. Enter Mapping Specialists. Having developed and maintained our own Web site, the technology of putting together the kiosk was familiar, but what did the tribe have in mind and more importantly, what was in the boxes they purchased? The first step was to sit down with the person assigned to have the kiosk created. During this meeting the “wish list” for the kiosk was discussed and a plan was developed for its creation. Everything went well in the meeting until it was conveyed that the project had to be part of that year’s fiscal budget. No problem, right? Wrong. The budget ended three weeks from the meeting date and in order for the project to be paid, the tribe needed the working kiosk in their visitor center by the end of their fiscal year. It still wasn’t known what type of hardware and software was available, and while the overall design of the kiosk was known, where the individual elements of the design were to originate weren’t. The first order of business at MSL was to get the hardware/software on site. Within two days of our meeting these arrived and to everyone’s delight all were in working order. Task one done! Next was to develop the elements needed to make the kiosk a functioning display. The program was to be divided into two parts, water management and lakes. Mapping Specialists undertook the task of creating 3-D images for the 15 lakes needed, while the water resources arm of the tribe scanned the legal documents and water management materials for the textual display. While our cartographers were busy creating the maps, our programmers were working with the hardware and software. The software was loaded and everything was prepared for the importation of the graphics. As the graphics were finished and digital documents received, each was imported into the program. Two weeks to the day the program began, we finished with a working kiosk. Two days later the system was installed and running at the Lac du Flambeau Water Resources offices, much to everyone’s surprise and delight – with one day to spare! The speed in which the project was completed isn’t the point of this article. The fact that we were able to do this project at all is the point. As most of you know, Mapping Specialists is a work for hire contract cartography company. Maps were a part of this program, but they were a small part. By thinking outside the box and utilizing our employee’s skills in extraordinary ways, we were able to meet a client’s needs and as well as expand our services. Are there opportunities you or your company may be missing out on? This past October, Arthur H. (Robbie) Robinson, a preeminent figure in modern American cartography, whose career spanned six decades, died after a brief illness. His passing was especially poignant to those who graduated from the cartography program here in Madison at the University of Wisconsin – as have many of the employees, past and present, at Mapping Specialists. Judy Olson, professor of geography at Michigan State and a protégé of Robbie, recalled that he was a fine gentleman and great mentor. Staff at MSL remembered how Robbie remained accessible after his retirement. His textbook, Elements of Cartography, became the standard for explaining the very principles of our field. A number of his books are at the workstations of employees here. And yes, MSL has reproduced more world maps using the Robinson Projection that he designed than any other world projection. For those of us in cartography, and especially here in Madison, we pause to remember a man who left such a professional and personal legacy. Geography: How’s Your Geography IQ? Each sentence below conceals a country, spelled in consecutive letters. Only the true globetrotter will find them all. Example: The foreigner ate lunch in a nearby café. The rock star was somewhat of an icon, going to great lengths to get attention. The toppled spire landed next to the church doorway, but caused no injuries. The restaurant served supper until 9 o’clock. Many people saw innocence in Diana of Wales. The cashier went to scan a dairy item, but the label was missing. Note: the printed Newsletter had these awards as being from 2003. They are actually from 2004. Alan Craig – MSL Project Manager and Systems Manager. 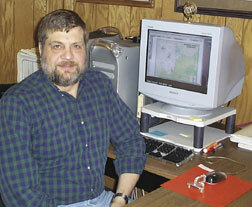 On August 30, 1984, Alan Craig became Mapping Specialists’ first employee. Below, Al steps back and reflects on 20 years of success. Let’s start with the “dark decade” first. Oh! It’s not as ominous as it sounds. In 1984, when MSL opened for business, mapmaking was literally finished in the dark. At the time, maps were produced manually using materials such as scribe coat, peel coat, stabilene, DuPont TS-5 (strip film), NAPS, PAPS, and positive or negative acting film. And we used tools known as scribers, Exacto knives, drafting pens, T-squares, type placement guides, triangles, drafting curves, light-tables, and a photo-mechanical type setter to create the maps for our clients. The actual mapmaking process is too lengthy to go into detail here, but the end result was a stack of flaps (pieces of material) generally made up of scribe coat, peel coat, film negatives, and film positives. The final approved flaps would then be submitted to the darkroom, with a flap plan, so that a set of composite film negatives or positives could be made. The set of composites would usually be made up of four negatives, one for each of the primary colors used in printing: cyan, magenta, yellow, and black. From 1984 to approximately 1994, maps were made in this way at MSL – in essence we made maps in the dark. From 1984 to 1987 MSL was housed in a cluster of basement offices on Wilson Street in downtown Madison, first in one building and then, due to an increase in business, in additional basement office space across the street. Because of business growth, MSL moved to its current 7,500 square-foot location on Applegate Rd. in 1987. Cartography at MSL continued to be analog until 1992, when we purchased our first computers. The first was an Apple Macintosh IIx, which was followed subsequently by a number of Apple Macintosh IIci’s – all with an impressive 80-megabyte hard drive and an additional 64 megabytes of RAM installed!! From 1992 to 1995, MSL was in a transitional phase. Then we used computers to enhance the traditional maps that we produced, but in the latter half of 1996 our total map production became digital. At the same time we replaced our darkroom proofing system with a new HP 755C 36-inch plotter. The next few years were extremely challenging. It was very difficult to convert from making maps manually to making maps on a computer. The most difficult aspect of this process was separating the map components from flaps to layers. Try to imagine working with media that divides the map components into a logical structure, then suddenly having to make a map with a new technology that does not allow you to place like objects on a specific layer (Adobe Illustrator 3)! Even more frustrating was, early on, needing to wait for software manufacturers to enhance their software to meet our needs – akin to, but radically different than other aspects of the graphic arts industry. Eight years later, and after at least five generations of Macintosh computers, MSL has a staff of 35 working on Power Mac G4’s with at least 786 megabytes of RAM and a 40-gigabyte hard drive. And, in 2003, we invested in the newest generation of Mac’s by purchasing a G5 with dual 2-gigahertz processors. Today, in order to fulfill the printing needs of you, our customer, HP 3500 DesignJet and HP 3800 DesignJet plotters, and HP DesignJet 20PS and HP DesignJet 5500 printers complete the mapping process in-house – thus bringing MSL from the Dark into the Light.